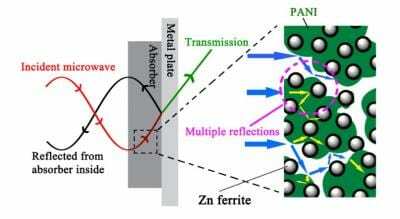 In a paper published in NANO, a group of researchers from Anhui University of Science and Technology have synthesized PANI/Zn ferrite composites which have shown excellent microwave absorption performance. How to reduce electromagnetic pollution? How do these materials attenuate electromagnetic waves? A group of researchers from the School of Chemical Engineering at Anhui University of Science and Technology have synthesized Fe ferrite/PANI composites as efficient microwave absorbers to reduce or eliminate microwave pollution. Microwave absorption materials with reflection loss (RL) values less than -10 dB represent that 90% of microwave was absorbed. The minimum RL values of this composite can reach -54.4 dB with coating thickness of 1.4 mm. The bandwidth about RL below -10 dB was 4.8 GHz at 1.6 mm. The excellent microwave absorption performance of PANI/Zn ferrite composites suggested that it can be used as an excellent absorber with thin coating thickness, strong absorption and broad bandwidth. Microwave absorption materials have been studied by many workers to reduce or eliminate microwave pollution. Because of rapid popularity and development of electronic devices, especially mobile phones, computers and wireless routers, microwave pollution has been intensified in recent years. These materials have great potential applications in information security, healthcare, electronic countermeasures and so on. The functional materials of PANI/Fe ferrite with lightweight, thin coating thickness, high efficiency and broadband absorption properties are also easy to synthesize, which is beneficial to industrial mass production. This work was supported by the National Natural Science Foundation of China (Grant 51477002) and Graduate Innovation Fund Project of Anhui University of Science and Technology (Grant 2017CX2105). The corresponding authors of this study are Ye Liu ([email protected]), Zhenfeng Liu ([email protected]), Huan Wang ([email protected]) and Hanxiao Jia ([email protected]).